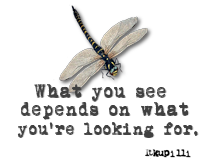 If you are like me you would like to have all kinds of arty goodness in the house but sometimes funds aren't always available or you could use the money for more important things like food or clothing. I am going to show you something I just made myself. I tried to research it a bit on the web but didn't find anything that I already had on hand to make what I wanted. I did recently buy some texture paste but it was on sale and had it not been I would have gone without. If I can make it I will and when my tube runs out, I will be using this great paste. I already have and I am about to show you how to make it and how to apply it. 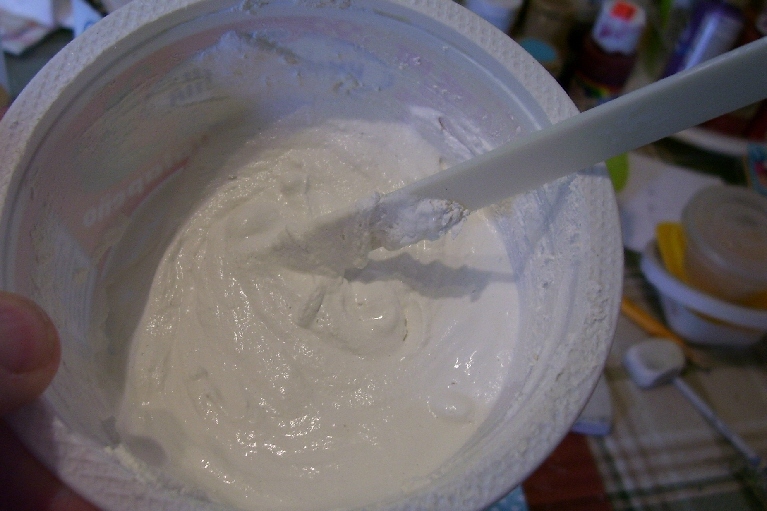 In mixing bowl pour some baking soda in , I didn't measure but I probably used a quarter of a cup or 50ml, enough to use for a few projects. Add white glue and squirt a good amount in about 2 tablespoons or 30 ml. Then add paint and squirt in some paint and start mixing, if it is too runny add a bit more soda, if it is sort of on the dry side and a thick and hard to mix then add more white paint. Stir until is is not runny but on the thick side. If you need to you can add a couple small drops of water and I mean small at a time to get it to a good consistency. Mine is like a thick icing. Now the fun part. 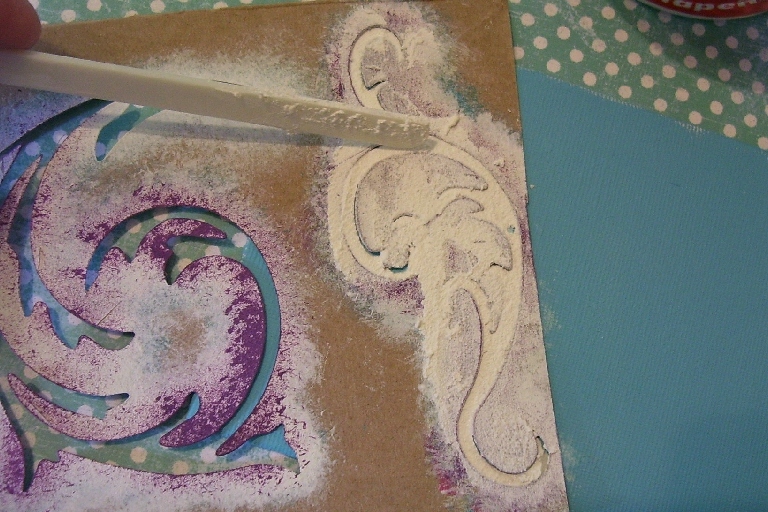 I have a stencil I have made from a Tim Holtz flourish die that I use on my canvases. I use the negative part. These are great. Now lay down your stencil, you can use whatever you have on hand, if yours are plastic remember to clean them well after you are done with water. Make sure your stencil is flat to the surface tape down if necessary. Then with your mixing stick or palette knife spread the texture medium over the stencil, you can spread it thin or if you want chunky texture spread it and make sure you get the whole area you want covered. Here is what it looks like and I made it nice and neat for you to see. 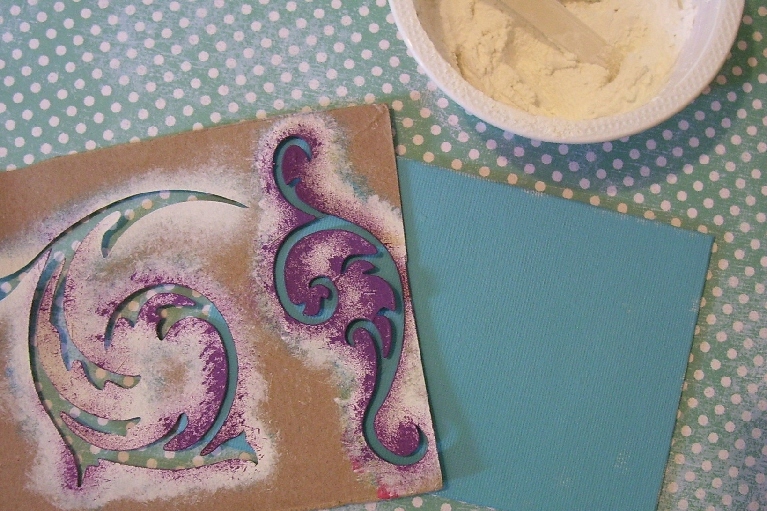 Now lift the stencil and you can see the wonderful texture that is created by these 3 ingredients, well 4 if you added water. Neat huh? Let it dry completely and I tell you the day I did this was hot and humid and it took no time at all to dry.Once dry you can paint over and around it. If you make a bit of a mess on the outside where the stencil was just take a damp cloth or Q-tip and clean up areas but it just adds to the background. 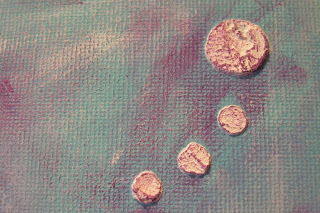 Here is the other end of the canvas where I did some circles, added some purple to the background and went over the texture with paint as well. And you can sand this if you paint over it and want some white to show through the painted areas. 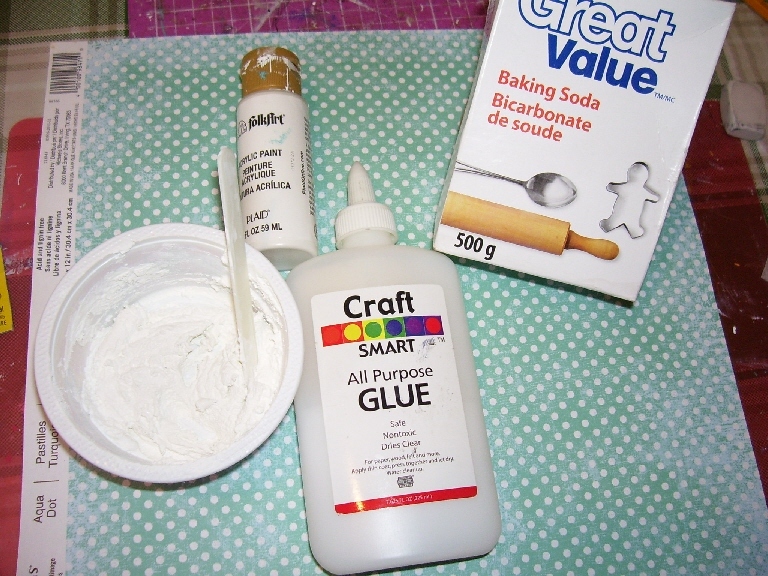 Just remember you need that glue as it binds the soda together, if not it will flake off easily. Make sure you have a good tight fitting lid for your container to cover your texture til the next time you use it. If it is a little on the dry side, add a couple drops of water and not too much. 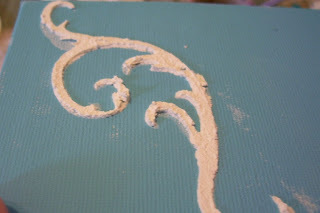 For bling after you paint your canvas and the texture you could add some Stickles or glitter glue to add some interest or spray with inks. Just try and see and let me know what works best for you. So there you have it. Faux or poor man's texture medium or whatever you want to call it. Fast, inexpensive, and so creative. If you blog about this please remember to link back to me and give me credit. That's all I ask. If you do projects using this recipe let me know and I would love to hear your feedback and see what you have created with this. Thanks for dropping by and just be creative and have fun doing it. Thanks for sharing! Always a good thing to be able to cut costs! I have a few colored tubes that I caught on clearance a while back but I've wanted some white. Now I can make my own! 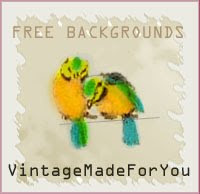 I just came across your blog via Art By Wendy. I love your work. I can't wait to try the texture paste. Thank you for dropping by Piggywhistles. The texture paste is great, I hope you let me know how it works for you. Send me a pic if you like. Great idea Les.. thanks for the tut on it.. can hardly wait to try this... love the colors on your blog..
You are very welcome Kath. Happy Canada Day. Fab tute Les...and better still i think i already have all the ingredients in my cupboards!! Must try this! !Thanks for sharing! I just bought some texture paste on sale but I want to try this. Maybe I will before I open the other one. :) Now where did I put the baking soda? That sounds like an awesome idea and so easy to make too. Wish I hadn't opened that tub that I just bought of that as this would have been way cheaper. I'll keep the recipe for next time though. Thanks for sharing. That is an awesome idea and sounds so easy. Can't wait to give this a try. Thanks so much for sharing. Can't wait to give this a try. Texture paste is so expensive. Thanks for doing all the research and sharing with us. Love this as the modeling pastes in the netherlanda are way expensive (only brands like golden and those are super expensive here). thank you for this recipe, will try and make this! :) couldn't find texture pastes here so this is very handy.